Should we be afraid of Venezuela's nuclear ambitions? For years, Venezuelan President Hugo Chávez cast himself as President Bush's arch-nemesis, repeatedly accusing the Bush administration of plotting to overthrow the Venezuelan government and to assassinate him. 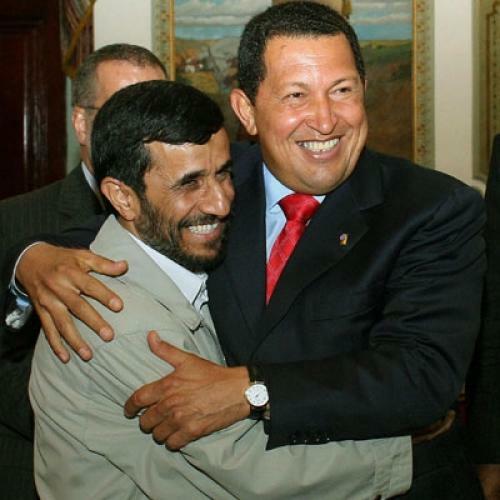 This was how Chávez justified an unprecedented military buildup and his tightening alliances with Russia and Iran. So, when Chávez first announced his intention to acquire nuclear technology for civilian purposes in 2005, some skeptics initially dismissed it as braggadocio to challenge Bush--sparking fears of another ostensibly peaceful nuclear program that could one day produce weapons. It now appears, however, that Chávez's nuclear ambitions transcend his antipathy toward the Bush administration. Bush, after all, is gone, and Chávez has tried to "reset" relations with the Obama administration. "With this same hand I greeted Bush eight years ago," he reportedly told President Obama at the Summit of the Americas in April, "I want to be your friend." But Venezuela's pursuit of nuclear power is moving forward in ways that are increasingly worrisome and possibly illegal. After a two-day trip to Iran early this month, Chávez promised to begin sending Iran 20,000 barrels of gasoline a day to help the country skirt U.S.-led sanctions in exchange for Iranian "machinery and technology." Venezuelan and Iranian media have interpreted "technology" to mean Iranian nuclear know-how. France, which last year expressed willingness to help Venezuela develop civilian nuclear power, felt the need to caution Venezuela against nuclear cooperation with Iran, which is under international sanctions for failing to halt its uranium enrichment program. Chávez has already begun cooperation with Russia. In November 2008, Venezuela signed a nuclear cooperation agreement with Russia whereby Atomstroyexport--the country's nuclear equipment export monopoly--would build a nuclear power reactor in Venezuela's northwestern province of Zulia. Already dubbed "Bushehr-2" by one analyst (after the reactor Russia has helped build in the Iranian city of Bushehr), a Venezuelan reactor would enable the country to diversify its energy mix and free up a portion of its oil and gas that is used to generate electricity. In August, Russian and Venezuelan officials met for the first time since signing the 2008 agreement to discuss training Venezuelan personnel in Russia on how to develop a nuclear program. Venezuela is also exploring its indigenous uranium deposits--some fear for export to Iran, which has limited known recoverable uranium reserves to sustain its own nuclear program. Jorge Asuaje Castillo, a member of the French Nuclear Energy Society, which in the 1980s conducted the only known study for installing a nuclear power plant in Venezuela under the auspices of the International Atomic Energy Agency (IAEA), believes Venezuela is rich in high-grade uranium. This year, the IAEA's Technical Cooperation Program agreed to work with Venezuela to estimate available uranium resources and to develop the skills needed to manage a nuclear program. And the Russian-Venezuelan nuclear cooperation agreement provides for geological exploration and possibly uranium extraction. Israel has accused Venezuela of supplying Iran with uranium--allegations that Chávez dismisses--and although there is little evidence to support such charges now, the two states have developed an unsavory relationship. Although reports of Iran's push into Latin America may have been overstated in some instances, Venezuela has genuinely intensified links with Tehran since the beginning of this decade, simultaneously defending Iran's nuclear program while promoting its own nuclear ambitions. Under Chávez, Venezuela has closely collaborated with Iran on everything from energy and military projects to agriculture and education. In 2007, Iranian Foreign Minister Manouchehr Mottaki estimated that the two countries had agreements valued at up to $17 billion--$2.5 billion in the form of memoranda of understanding, $8.3 billion under negotiation, and $7 billion worth of projects waiting to be signed. Some of this cooperation is decidedly suspicious.The Iran-Venezuela Joint Bank, based in Tehran, was opened in April 2009 with an initial capital base of $200 million. That money is managed by the Export Development Bank of Iran, which the U.S. Treasury Department has designated a "proliferator" for providing or attempting to provide financial services to entities that advance Iran's nuclear program. It is but one of many examples of covert "sanctions-busting" financial schemes implemented by Venezuela and Iran, as New York District Attorney Robert Morgenthau pointed out in The Wall Street Journal. Indeed, any assistance to Iran's nuclear program would violate UN Security Council Resolution 1737, which bans all states from supplying Iran any "items, materials, equipment, goods and technology" that could abet its enrichment activities. Unfortunately, it is difficult to obtain a clearer picture of the scope and extent of Venezuela's nuclear activities. Although Venezuela is a member of the Nuclear Non-Proliferation Treaty and has signed a safeguards agreement with the IAEA, Chávez has refused to sign the Additional Protocol, which would give the agency broader inspection powers and obligate Venezuela to provide "the location, operational status and the estimated annual production capacity of uranium mines." If Chávez is serious about developing a civilian nuclear power program, he should affirm his commitment to nonproliferation by implementing the IAEA's Additional Protocol and clarify his dealings with Iran. Otherwise, it won't matter if he wants to be Obama's friend--the United States will consider him a rogue. Nima Gerami is a research assistant in the Nonproliferation Program at the Carnegie Endowment for International Peace and editor of Carnegie's Proliferation News.